Gameloft have just introduced a new scheme called Gameloft club. Available for UK android users only, it lets you download one game per month for only 0.99p. That's a lot cheaper than Gamelofts current prices. It doesn't seem like you have to pay anything to join the "club" either, so it's a win win situation for android game fans. They have also created a contest in the hope of getting people signed up. 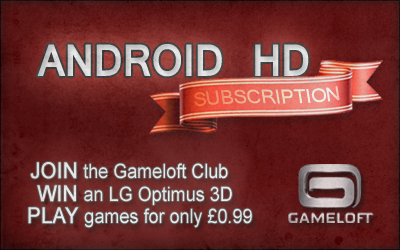 If you register for their Gameloft Club between now and midnightÂ Monday 29th August, you will be in with a chance of winning a new LG Optimus 3D. I've had a play on some 3D games on that phone, and was very impressed, so it might be worth your while signing up.